With the holidays just around the corner, a little prep now can drive big results in November and December. In 2014, holiday retailers spent 45% more on Shopping ads compared to 2013 according to Kenshoo’s 2014 Global Online Shopping Report. This means that Shopping is more important to holiday paid search strategy than ever before. And the best way to maximize your holiday Google Shopping revenue is to treat Shopping separately from regular Search in your holiday PPC strategy. Below are 3 Shopping-specific analyses to ensure you’re getting the most out of your Shopping campaigns during the holidays. Was there an increase in Shopping CPCs from Q3 to Q4 2014? Were there month over month changes in Q4 2014? Did Shopping conversion rates increase from Q3 to Q4 2014? How did conversion rate change month-over-month in Q4 2014? When did Shopping impressions start to increase for the holidays (look at both monthly and weekly changes)? The client below saw a 53% increase in CPCs from November to December, indicating the steepest increase in competition. However, the 32% increase in conversion rate from October to November justifies increasing bids to combat competition and maintain or increase Shopping click volume. Don’t forget to identify exactly when conversion rates dropped off after the holidays so you can preemptively pull back bids before ROI begins to drop. 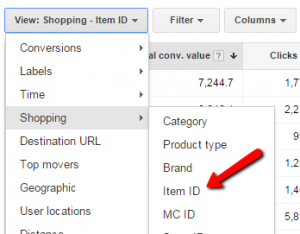 Take advantage of the Dimensions>Shopping report in AdWords to figure out which products brought in the most Google Shopping revenue last holiday season. Sorting by Total Conv. Value (revenue), identify the top revenue-generating Item IDs from last year. Do you still have those products in stock? Are they still in the feed? If so, break out individual product targets for those Item IDs so you can set high bids at the individual ID level. According to Kenshoo, the 2014 holiday season saw a 79% increase in mobile paid search clicks and a 120% increase in mobile revenue. Desktops actually saw a 16% decrease in paid search clicks and an 8% decrease in revenue. That means mobile should be a larger part of your holiday strategy than ever before. Look at how mobile performed during Q4 last year compared to the rest of the year. Even if your Shopping campaigns typically perform far worse on mobile than search campaigns, this could be the one time of year when you see an above-goal mobile ROI. The client in the example below rarely hits a positive ROI on mobile Shopping ads. However, during the 2014 holiday season, they saw an 85% increase in mobile conversion rate and a 300% increase in mobile ROI for their Shopping campaigns. Even though our mobile Shopping ROI has been under 1.5 for most of 2015, I will increase mobile bids in November to take advantage of the temporary surge in mobile conversion rate. For Shopping campaigns not currently running on mobile, you can get a rough estimate of how mobile traffic will perform by looking at your non-brand search campaigns’ desktop & mobile conversion rates. If you typically see a 4% conversion rate on desktop non-brand search, and a 2.5% conversion rate on mobile, then you have a 38% lower conversion rate on mobile. Apply that to your Shopping campaigns for a rough estimate. If you see a 6% conversion rate on your desktop Shopping ads, you can expect around a 3.8% conversion rate on your mobile Shopping ads. These 3 analyses are a small sample of the ways you can use last year’s holiday performance data to drive even stronger results this year. By setting aside time in the fall to analyze last year’s Google Shopping performance, you’ll be poised to drive year-over-year revenue growth and take full advantage of holiday opportunities.